There are lots of fabric refresher and room deodorizer sprays, but do you know what's in them? Make your own, save a whack of money, and feel confident that you're not introducing all kinds of chemicals into your life. This is my refresh spray, developed after several years of experimentation. Finding the right ingredients and the combination of scent and dryability took lots of trial and error but here's the final result. I use a very industrial style spray bottle, from the hardware store, but if you have a nice atomizer or perfume spray bottle, that would be nicer to use. You could feel very high class, wandering around your home, spraying curtains and the couch and making the room smell fabulous. Caution; until you know what kind of effect this will have on fabrics, spray an out of the way corner to test it first. Also, keep in mind that essential oils such as Tea Tree oil may be toxic to dogs. Water; distilled water is best, but bottled water or rain water is fine too. I stay away from tap water, because of its mineral content, or the addition of chlorine or fluoride. 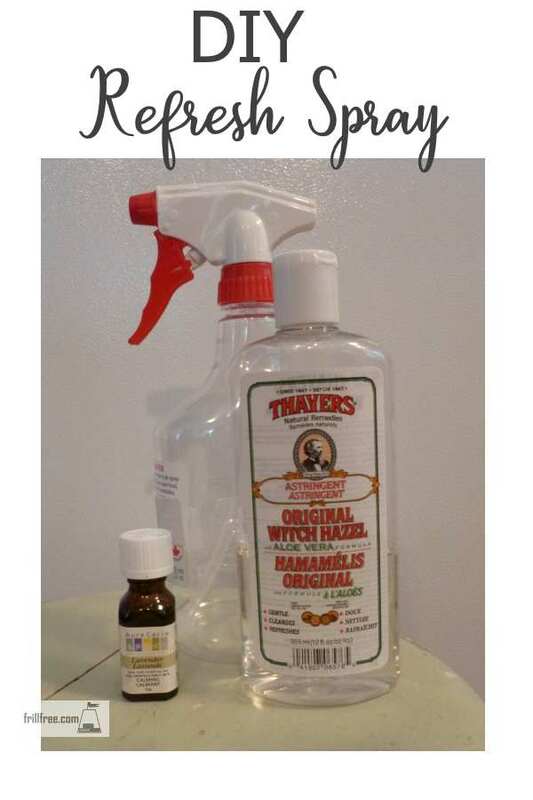 Pour about a half a cup of witchhazel into your one liter spray bottle, add four or five drops of essential oil, and about one quarter cup water. Shake well, spray away.